Today I am celebrating the 10th anniversary of when I started this website, 365DaysOfCrockpot.com! I started the site with one idea in mine. Can I cook 365 different slow cooker recipes over the course of one year? It took some effort and a lot of slogging through mediocre or even bad recipes but I completed the task. When I started blogging the world looked a little different. I had never heard of or used Facebook, Pinterest, YouTube or Instagram. I had a 3 megapixel digital camera and I had no photography skills. I had a 6-month-old baby and a 3-year-old toddler. And my only goal was to finish the year out like I said I would and to perhaps put together a homemade recipe book of all the recipes that I liked. Well, 10 years later I’ve made hundreds (maybe thousands?) 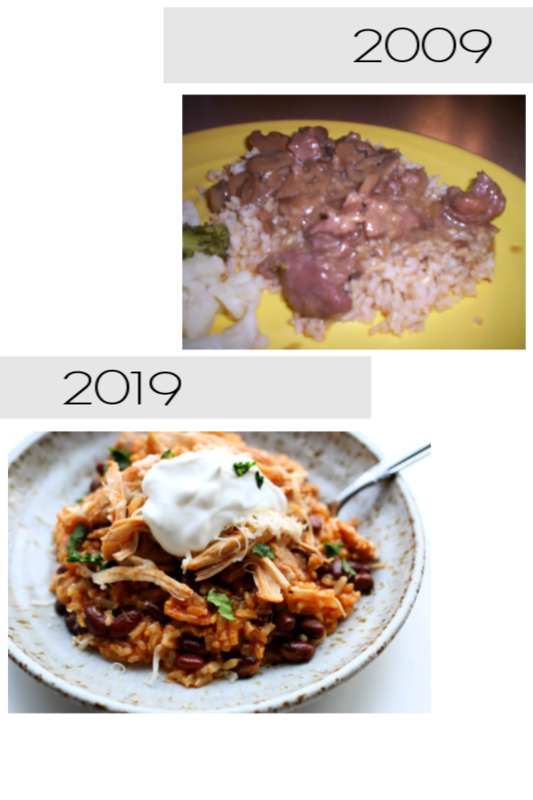 of recipes, had 3 cookbooks published (first, second, third*), started using the Instant Pot* in addition to the trusty slow cooker and changed the trajectory of my family’s life. This year we were able to become completely debt free (mortgage included!) because of the income I’ve made over the years from my website. This website has been a blessing to me but it wouldn’t be anything without you and your support. Thank you for coming here to this little space on the internet and finding your easy dinner recipes. Thank you for commenting and letting me know that you liked the recipe. Thank you for joining me on Pinterest, Facebook and Instagram. Thank your for watching my nerdy YouTube videos. Thank you for sharing the recipes with your friends. Thank you for joining my email list and forwarding the recipes on to your mom, sister or friend. You’re just the best. To celebrate this occasion I am giving away your choice of an Instant Pot* , a slow cooker* or a set of my favorite Instant Pot accessories (stackable pans*, shredding claws*, silicone sling* and steamer basket*). Enter to win below! I will pick a winner in one week. Congrats on the milestone! I;m super intrigued by the accessories! Congratulations on 10 wonderful years!! I love your website, and its always my go-to when I’m looking for new recipes or what to make for dinner tonight! I would LOVE to win an instant pot!! Thanks for the opporunity and the cool give away!! Congratulations on your 10 years! I love your recipes, and I am new to the instant pot. I am trying the chicken, pesto, and pasta tomorrow! Congratulations! I bought my first Instant Pot for Christmas! I need those accessories please! I would love to win the Instant Pot. Congratulations on your success. Happy for you. Congratulations on all of your hard work! I would love a chance to win some accessories to use with my instant pot. Thank you so much! Love trying out new recipes. A new instant pot would be a great addition to my collection. I am a recent instant pot convert thanks to your website! I was a big fan of your slow cooker recipes and I finally decided to switch over when my trusty crockpot finally gave up the ghost. Wish I had switched sooner! I enjoy getting your recipes. I would love to win an instant pot. I enjoy getting your recipes. I would love an Instant Pot. Definitely the Instant Pot for me! I am helping a couple of households out with making meals (sharing mine) and I can’t get everything I need done with one. I had two but had to sell one when I needed money badly and quickly and have really missed it. It . It makes it so much easier for me when cooking for a number of people to have them both going. Congratulations, and thanks! Instant pot accessories would up my game in creating meals in the instant pot! CONGRATULATIONS on 10 years! Succumbed to pressure from best chef in neighborhood to grab an Instant Pot. Now, with all of your tried and true recipes, I can start my own adventure down the culinary “rabbit hole”. My wife and I should be getting commission from the Instant Pot folks as whenever we have visitors and they comment on the food we tell them about the instant pot as well as the regular e-mails with recipes. Several have gone out and bought the pot. We would love to get a bigger pot as we currently have the 6 qrt and are finding it a bit small. Congrats on10 years! I found you about 1 month ago! I would love the accessories as I have the insta-pot and slow cooker already. Thanks! i just found you, thanks to your interview with Jim and Ricky from Income School. Glad to read up on your recipes. I am a new blogger so i am also interested that you did this awesome blog with awesome helpful recipes and tips for anyone lucky enough to find you! Meanwhile, my oldest daughter is about to be “between houses” living in the RV until school is out and looking for crockpot recipes and has asked to borrow my intant pot also. with a husband and two little ones, she is hoping to come up with some delicious new meals! So, if I were to win, i would probably hope to win a new Intant Pot so i could give it to her! I am certain that she will find that it is amazing when she borrows mine. Thanks for all your hard work and generous heart! Love your recipes and so has my family. I would love the accessories to expand using my Instant Pots. This is a tough choice. I think I would use both (I’ve been eternally undecided on which one to buy) but I think I’d rather start with the Instant Pot. I’ve had trouble entering, operator error, I’m sure! Ha. I would like to have the slow cooker, as mine are OLD! Thanks for a chance! I’m so glad I found your website! I’ve tried several things in my InstantPot! You’ve saved me! Thank you so much! I’m a newbie to your blog. I recently purchased an Instant Pot and came across your blog searching for recipes. I love love your recipes. Thank you so much for sharing. I’ve recently discovered your blog, thanks to a friend’s referral. I’ve been saving recipes and hope to try them out as soon as I get home. We’re traveling right now. I haven’t had much luck with my instapot. Recipes I’ve found on-line have not been a success. Can’t seem to get the timing right. But your recipes are so specific and my friend says they are right on with the times so I’m anxious to try them, And if I would win the intstapot I’d give mine to my daughter along with some of my favorite recipes from you. I would love the IP! So glad I found your website and YouTube channel. I do have an Instant Pot and yes it is still in the box. I’m not afraid to use it but I don’t have any counter space for it so I’ve ordered a kitchen cart to put it on. Should I win, I would like the silicon trivet and steamer. Congratulation to those that do win. I would love to have the accessory bundle! Congratulations on 10 years and here’s to many more for you!!! I would choose the instant pot. I have heard so many good things about them. I look forward to your emails so I can see what new recipes are out there. Sometimes my appetite isn’t so great and your recipes wake it up. Congrats on your 10 years. I wish you the best. Thank you for 10 years of wonderful recipes! I would love the crockpot. I would like an instant pot – trying to get enough nerve to try one. I’ve been saving your recipes to review and use later. .
Oops! almost forgot: Instant Pot please. Your kids’ pictures–Wow! 10 years: a lot of water under that bridge. Good for you for becoming debt-free. Congrats on 10 years! You have really helped me get going in my instant pot cooking! Thank you for taking the “fear” out of it. Whoops! Mine got away from me too soon. I would like the instant pot accessories. Love all your inspiration! Thank-you for the giveaway too. Congrats on your 10 year anniversary! I’ve been following you for about a year, and am glad you keep creating recipes that my family tries! I would love to win the accessory set!!! You’ve come a long way, baby. Congrats and thank you for your time and talents. If I win, I’d love an Instant Pot. You are AMAZING!! Thank You for everything you do to make my life easier. I would love to win the accessories!! Karen thanks for sharing so much of your self with us. You’re inspiring in so many ways. Cheers re even more milestones passed. Here’s to a nourishing 2019 for you and YOUR beloved family, Karen! Your website has made using the instapot a pleasure. Love the recipes. The accessories would be great to have. Thank you for a great website. Happy #10! Love your recipes and would love the instant pot accessories! I’m so glad I found your blog! I enjoy reading it & trying all tour amazing recipes! I would love the accessories kit! Congrats & thanks for the awesome choice of giveaways! I’d love to win an Instant Pot to give my daughter since she loves using mine that I got for Christmas! I would choose the instant pot. I would chose the instaPot. Happy blogiversary. I would choose the Instant Pot. HAPPY ANNIVERSARY! Accessories would be great. I would love to have the accessories. Thanks for the chance to win. Congrats on your 10 years! I love your recipes. I only have a crock pot and I use it often. I’d like to win the Instant Pot. Thank You! Thank you so much for your hard work! As a newbie with the Instant Pot, you’ve been a tremendous help. I would love the accessories for my IP to continue to try out new recipes. Thanx again!! Congratulations on you’re success. I haven’t had a bad recipe from you… they’re all good. I love my instant pot, but I need a slow cooker. I’d love to win that. Congratulations on ten years! Thanks for the recipes. Need a new slow cooker……..
Congrats on 10 years and beautiful children. Went fast, didn’t it? I wouldn’t be using my IP if I hadn’t found your website. Everyone I’ve told about it come back to thank me for that info and I must thank you again. I would like the accessories but I have used your substitutions. I like to win the Crockpot! Congratulations! You have made a difference in many cooks lives, including mine. Very delicious, easy, fast and fun short-cut recipes. Going to make the cheater lasagna this week. Love your choc. desserts too!!! Thanks again for all of your fantastic recipes! Forgot to mention that I would LOVE the instant pot accessories. I absolutely love all of your recipes and they are my go to for my instant pot and slow cooker. I would love to win the accessories for the instant pot as I do not have any. Thank you for all of your hard work!! Congratulations to you for your accomplishments!! I love your recipes so much, I’ve sent to all my friends and to my daughters. I would love to receive the Instant Pot. Thank you for doing this, and may you continue to grow and glow!! LOVE YOUR RECIPES, HAPPY ANNIVERSARY! THANK YOU SO MUCH! HAVING A BIGGER INSTANT POT WOULD BE GREAT. Making your hot wings recipe for Super Bowl party!! I would love to win an Instant Pot. Congrats on 10 successful years! Instant pot recipes are great! I would enjoy IP accessories. Happy 10 Years! Thank you for the chance to win. I don’t own an Instant Pot yet so I would choose the Instant Pot. Have a great day! I would love the instant pot if I win. love your emails and also your recipes. Thank you for all you share. Best recipes ever have loved everything I’ve tried. Would love a instant pot for my daughter or the accessories!!! I would choose the instant pot! Hi Karen! Thanks for warming our tummies and hearts with your delicious recipes! I would love an accessory kit for our instant pot. Have a great 2019! I love your slow cooker recipes and would love to win an Instant Pot so I can try those recipes! I found you a little over 2 years ago when I got my first IP, your recipes are delish and super easy which I love! Congrats on 10 years, can’t wait to learn about more yummy dishes! If I were to win, the accessories would be my first choice, but the IP would be great as well. I have a friend who needs a lung transplant and an IP would be a perfect gift for her! I could really use the accessories. Congratulations for your 10 years. I just know your next 10 years will be even better. congrats on 10 years! I would love an instapot! Hi Karen, I love your recipes on my web sight.. I try them all, I have printed many off… My husband says your Risotto recipe is so close to his that he cooks for 30 minutes on the stove… He is Italian and is a good cook.. We are having a dinner party and I am serving this to my guest. If I should be chosen I would like the accessories. I have the 8qt. instant pot… I also use the slow cooker side of it to..
Congratulations on your Very Successful 10 Years!!! I’d LOVE to have the accessories. My best wishes for another Very Successful 10 Years!!! Would love another instant pot. Thanks for your fantastic recipes and ideas!!!! I’d love to win the InstantPot for my sister. She doesn’t have one and is impressed with my cooking using mine. I even took mine on vacation and made dinner for us using it. It was her first time seeing the Pot in action and she was impressed. It would make life easier for her cooking dinner for her and her son. Thanks for all your yummy recipes that I get to cook. Congrats on 10 years. I would love to win the accessories!! Congrats on 10 years! Hard to believe it has been 10 years already. Congratulations! I would love to win the Instant Pot. Congrats! I’d love the accessories to go with my three instant pots! Made my family get hooked on using the instapot. If I win I would like the accessory set. Thanks and Happy 10th Anniversary to you! I love the then and now pics too…cute kids! I would love the IP accessories! Congratulations on 10 years. Love your website and emails. I was a little intimidated by the instant pot but after utilizing your website and recipes I have conquered my fear. I absolutely would love another instant pot. Onward to another 10+ years. I follow your 365 Days of Cooking and, obviously, I really enjoy reading about the day’s recipe and have tried many of them. Because I have the different pots, I would like the claws to tear apart the meats. Keep up the good work. Would love a crockpot for the low and slow we sometimes need. LOVE you recipes! Congrats on 10 Years!! I would love an instant pot. Love your recipes! I think I would go for the Instant Pot Accessories. I love your recipes and the tips have been very helpful. I would love an instant pot as I have a slow cooker. You have been my Instant Pot guru ever since I found you. Your recipes are my family’s favorites! You’ve made my life easier and I am grateful. Love the recipes; lots of ’em to look through and try; an Instant Pot would be a welcomed addition!! Thank you for all the recipes. I would like the Instapot accessories. Congratulations on your 10 years! Love seeing the pictures of your first recipe and today’s recipe, and the ones of your kids! They grow up fast, don’t they! I love getting my emails from you with a new recipe to try. I bought my daughter an Instant Pot for Christmas this year and I directed her to your website for recipes. She loves it too! I think I would want the Instant Pot accessories. I don’t have those and would be able to do so much more with my Instant Pot!! I’d choose the accessories. I’ve been wanting to try them. Love the way your daughter embraces her younger brother. LOVE definitely fostered in your home! I gave my daughter my crockpot as hers died, so would love the crockpot! Blessings………….. I look forward to opening my emails and seeing 365 sandwiched in b/n all my billing statements. Funny how this mirrors the days when I would go out to the curb and look into my street mailbox in hopes of seeing my magazine deliveries. And you never send me a bill! Thank you for all your hard work in creating and sharing your worthy IP recipes. I would love to have the accessories for my Instant Pot! Congrats on 10 years. Thanks for the picture update of your beautiful kids. I’d really like the Instant Pot. I’m looking forward to more delicious recipes. Thanks for all you do for all of us. I recently purchased the Instant Pot Ultra 6 qt., so I would choose the accessories. Thank you for all the amazing recipes! Congratulations on 10 years of awesomenes! I would love the instapot accessories! Congratulations on your 10 year anniversary and thank you for sharing your recipes and expertise! If I am chosen, I would love an Instant Pot! Thank you for the chance to win. Love your site. I reccommend it to my friends. My husband even LIKES your recipes and he is like Mikey, he hates everything. I would like the accessory pack for the IP. Love learning more ways to use my instant pot. While, i would like the accessories for my instant pot, I would ask for the instant pot to gift to my daughter in law! Congratulations on ten years with your website, and becoming debt free! My daughter will be graduating from college in a few months and will be setting up her own household. I would love to gift her with an Instant Pot to help her with her vegetarian lifestyle. I’ve learned a lot about using my IP from your posts and recipes. Thanks! I would love the accessories. Happy 10 year anniversary! My family and I enjoy your recipes, thank you so much. I would be interested in the instant pot. My instant pot is an invaluable kitchen tool. A great time saver. Instant Pot, please! Thank you for all the great recipes! Instant Pot would be nice, and Thanks for the recipes. Thanks for all your recipes over the years, my family lives them. I’d choose the accessories. I have a 6 and a 3 quart IP already but I could use some of those accessories. Congratulations! I would love the Instant Pot accessories. I Have a Instant pot and love your recipes, but would love a new Slow cooker, mines at least 10 years old . Your recipes have helped me embrace my IP! I am the primary caregiver for my 92 year old mother, and using the IP to quickly make delicious and nutritious foods is a big help to me. Some days I just don’t have the time, energy, or creativity to think about cooking but your recipes and “can do” attitude give me an oft-needed boost. If I win I’d like to receive the slow cooker, please. Keep up the good work and here’s wishing you another 10 years of cooking love! Thank you for all you post and explain, I had my instant pot for 8 months before I decided I had to learn about it and there you were, ready to help. Now I cook in it several times a week and have lost all fear. Love the meat especially, how tender and tasty it makes it. I would want the instant pot as I have a friend who I think would love to have one but like me, is afraid she wouldn’t use it or like it. I know she would with your help. Wishing you another happy and healthy 10 years.. I am new to the instant pot but have been successful with my recipes b/c of your tips and thorough directions. I would like the accessories package. Thank you and congratulations on your blogging success! I have loved getting your recipes and have tried many. I found some wonderful healthy recipes that have given me variety and they are really tasty! Thank you for what you do. You are a blessing in my life. I never miss reading your blog and have saved hundreds of your recipes. I would love some IP accessories. I’d like the Instant Pot accessories. Thanks! Instant pot please. Thanks for doing a giveaway! Happy anniversary. Here’s to many more! Thanks so much for all the great recipes and time that goes into this blog. I would love to win the instant pot. My favorite recipe from you is a chicken vegetable soup recipe, so tasty! Congrats! love the recipes!!! I would love some IP accessories! Congratulations, I am looking forward to seeing your recipes. I LOVE my instant pot. Congratulations on 10 helpful and informative years! Wishing you many more happy, healthy years! The Instant Pot accessories would be great! tHE Crockpot for sure! Mine just died! Congratulations on 10 Years! I would choose the instant pot accessaries. I would Love to have the Crock Pot For Large Sunday Dinners! Thanks and Congratulations on your anniversary!! I’d pick the crock pot! Happy 10 years! Hi I’m new to your blog, but having been using your slow cooker cook book for a long time. I love your recipes and just got an instant pot so I would love the accessories package. Thanks for all of the yummy recipes. My mom used a stove top pressure cook way back in the 60s. But the Instant Pot seems so much better. Love that I can do my gravy (aka spaghetti sauce) and meatballs in 20 minutes. My mother in law would have frowned. I would take the IP accessories. Would not turn down a new IP either. If I win, I would really like the Instant Pot accessories package please. I am enjoying all your recipes & ideas for using the instant pot that I received as a Christmas gift. Thanks for the help. I could sure use the accessories to go with it. Got. 3 qt mini Instapot for Christmas but would love a 6 qt!! So much more I can do with one! Happy Anniversary!! I definitely would want the instant pot since I’ve always been tempted to try this brand but never find one on sale. Because of your blogs, I decided it was time for me to get an Instant Pot. I was leery at first, but after a few accidents, I have finally become a constant user of the Pot. Desserts are my specialty, and I love how easy it is to create some fantastic recipes. Thank you so much for your encouraging recipes and help. Great contest! I have been reading and saving your recipes and would love an Instant Pot! I love and use so many of your recipes! Thank you for sharing and congrats on the 10 year milestone! I would love the slow cooker. Congratulations! Love your recipes and blog have two Instantpots and would love the accessories. Wishing you another ten years of success. I really appreciate your recipes. The pictures are a bonus! I’ve tried MANY of your instant pot recipes. Thanks for entering me into the giveaway. Congratulations! I would choose the Instant Pot accessory pack. Thanks for this great contest. I would love another instant pot. Where would we be without your delicious recipes. You’ve made me a chef! Congratulations on 10 years. Here’s to the next 10. Congratulations on 10 years. I have made several of your recipes and they have all turned out delicious! Always looking for a new recipe to make in the Instant Pot. I’m thinking I need a second Instant Pot for our large Sunday dinners. Thanks for the chance to win one. Thank you so much for sharing your wonderful recipes with all of us! I have loved them so much. Congrats on 10 years also! I said it once, and I’ll say it again – your daily emails and recipes are life changing!! I’d love the accessories please! I really like your “365 Days” recipes. I’m retired and do most of the cooking, my wife bought me an instant pot 2 years ago and I regularly use it. I used to make a lot of recipes in the slow cooker but I’ve adapted most everything I used to make in the slow cooker to the instant pot thanks to your site. The recipes are easy to make and truly delicious. Congrats! Love your IP recipes. Follow you on FB and via your emails. So, would love another instant pot, thanks. I would absolutely love the accessories!!! Thank you for all of your great recipes! Congrats on 10 years! Love all your recipes. I think a second instantpot would be great. Have all the accessories. Love my Instant Pot AND your recipes! I would love to win the accessory package! Please send me a slow cooker as I don’t have one and I can make so many meals in it. Congratulations to your 10 Years. I love using my slow cooker but am fairly new to the Instant Pot. Your recipes have helped me become a bit more familiar with the IP. Thank you. I would love to win the IP Accessories. Thank you for providing us with new recipes every week and for this give-away. Happy blogaversery, that instant pot looks awesome. Thanks for helping me learn more about my new Instant Pot by using your recipes. I await your recipes and enjoy them very much. I would like the accessories. I have a 6qt and 8qt PC and multiple slow cookers. I don’t think I could store another one. I believe I found your webpage through Facebook and it looked good and I needed to check your out. I love recipes especially those that use ingredients that I have heard of and quite frequently keep on hand. Love your recipes. I just gave your website to two friends one who didn’t know she could make soup in her pressure cooker and shared the recipe for Tuscan White Bean Soup with another friend who has an instant pot.. Would love the accessories if I win. Your recipes are ones that I would try first. Recipes that would please my family. I would appreciate any of the gifts offered. Congratulations on 10 years! I’m new to the instant pot, so I appreciate your insights and recipes immensely! Thank you so much!! If I won, I would like the instant pot accessories. Love your website!! It’s really changed our family this year!! Congrats on your anniversary! I keep all of your blogs daily. When I don’t have time today to look over everything, I go to my saved days & look for what I’m in the mood for. IP accessories would be a big boon to my kitchen. I am brand new to the Instant Pot and would LOVE the accessories so I could be more adventurous in what I cook in it!!! Thank you so much and CONGRATULATIONS on 10 years!!! For whatever reason, I was unable to comment when I entered your giveaway but managed to get an entry somehow. I would like the accessories if I win. Thank you. Happy Anniversary! I would love all of the accessories! Congrarts on 10 years. Read & use your posts often. I’d love the instant pot, instant pot accessories or the crock pot in that order. Happy 10 anniversary !! Instant pot, please! Congratulations on 10 years of helping others! That’s quite a feat! You are my “go to” for IP and slow cooker recipes. Thank you for all you do for us! Should I be a winner, I would choose the IP accessories! If I were to win I would choose the crock pot. I have an older model with 3 size bowls but it is getting very heavy to lift. 10 years is impressive! Thanks for all you do. My IP is hands down my favorite kitchen gadget, so I love any recipes I can get my hands on. I’d love the accessories. I love seeing your IP recipes in my morning e-mails. It gives me an idea for dinner and the first task of the day is done. Another IP is my wish! Some meals would be easier with two doing my work. If I am picked, I would like the Instant Pot Accessories. I would love the instant pot. I have two homes and would love to not have to transport mine all of the time: Congratulations on 10 years and thanks for a recipe everyday! LOVE ❤️ your recipes and insight—every one of your recipes has been fabulous and cooked perfectly! I’d LOVE the accessory pack for my instant pot! Congratulations on 10 years! Lucky me, I found you early on. I loved following you since! I would love to have the Instantpot accessories. I would choose the Instant pot accessories, I have the 8 quart pot. I love your recipes, I have tried several. I just made your Risotto and my husband who is Italian and makes it on the stove said it was delicious and just like his. I did add the saffron as we get it from Italy when we visited our family. Thank you. I started printing and saving your recipes. I recently discovered your web site and look forward to trying your recipes. I have a mini instant pot and would love to have a 6 qt to use with your recipes!!!!!! Congratulations!! I love, love your web-site! Thanks for all the great recipes! I would like the instant pot. Great recipes…healthy,too! Instant Pot for me! After buying an Instant Pot this past fall, I was afraid to use it. There is a learning curve, but with your recipes I have become much more comfortable and I use it at least twice a week. Looking to use it a lot more! Congratulations on 10 years! Based on the amount of comments I had to scroll through, I’d say you’ve made a huge impact in the blogging world. Thank you for your ideas and bringing tasty recipes to so many homes. If I were to win, I’d want the Instant Pot accessories. Your recipes have saved me on ‘what on earth are we eating’ days! I love my instant pot, but one can never have too many accessories! Congratulations on 10 years and being totally debt free! I like your recipes because you use “normal” everyday ingredients! I would like the instant pot accessories. No wonder you’ve been going for ten years……here’s to many more! Can’t wait for the recipes to come. You are a life changer. My wife and I can’t afford an instant pot right now, so having an opportunity to win one would be great. I LOVE that you have converted slow cooker recipes into Instant Pot recipes. It makes meal prep so much easier. One days that I’m home a slow cooker stew makes the house smell wonderful. On most days, the Instant Pot makes dinner delicious. Thank you for all your hard work. I forget to add that I would love the Instant Pot accessories. I wish I would have found your blog years ago! I fell in love with my slow cooker while cooking a lot of your recipes and would love to fall in love all over again if I won the Instant Pot! Thanks for so many great recipes!! Not sure how I stumbled onto you and your site, but am GRATEFUL that I did. I’ve made several of your recipes now and you’ve gievn me hope with my still-new IP. Congrats on your successes, keep inspiring us! I have been enjoying reading and saving your recipes. I would love to win the accessories. I would then gift them to my daughter for her InstaPot. I Love your recipes. They are very easy to make. I would like the Crockpot. Wow. That’s a lot of comments to go thru. You’re my go to. Want the accessories. It’s wonderful that this work has been so successful for you ~ congratulations!! We just started using an Instant Pot too so we’d love the accessories! Love this site! I found it for IP recipes but am pulling out my slow cooker again as I’m inspired by some of your recipes! I don’t know if I’d replace my well used and a little worn out slow cooker, or pick the IP accessories. I would want the Instant Pot accessories. I don’t have any other than what came with the pot. Thank you for the variety of wonderful recipes. I have an Instant Pot, but would love to win one for my mother. She is 76 and still cooks for herself. The other day I was telling her about some of the wonderful recipes and she expressed how she might be interested in getting an Instant Pot. I would love for her to have the ease of one-pot meals, and easy clean up. I have found more great Instant Pot recipes from your site than from anywhere else – internet or printed cook books. Thanks for your hard work. I would want the Instant Pot accessories if I win a prize. I have a Crockpot Express, but all your recipes work well in it! Best wishes for 10 years! I prefer your recipes to any from cookbooks that I own for my Instantpot. I would like the accessories, please. I recently found your site and am thrilled! Can’t wait to try several of your yummy sounding recipes. I’d love the Instant Pot accessories for even more uses! I love your recipes! What a great site. I would really enjoy the Instant Pot accessories. Thank you for all of the time you have put into this. It has also benefited my family. I started following your blog first. Bought your first cookbook, subscribed to your email list, then bought your second book, third and have been loving the addition of the instant Pot recipes!! I have told all of my family and friends about your site and recipes. So thank you again from us all and happy 10 year anniversary. I would choose the instant pot accessories if I won. I would choose the accessories -so I can use my Instant Pot even more! I’m new to an instant pot but I love your blog and your recipes! Thanks for such great content. I love your site and have made several of your slow cook recipes. My all time favorite is the shredded beef for gyros. I would love a new crockpot! I love this website and have recommended it to several friends!! Always find great recipes!!! I would love to have the stackable pans!!!! I love your site, I don’t have a instant pot yet but saving for one so I have a big pile of recipes just waiting on me. keep up the good work. Have loved your site since I got an Instant Pot, and have tried many of your recipes. I’d like to win the Instant Pot … since I bought a mini (because I knew nothing about IPs at the time! ), and would love a full-size one to make your recipes and others fully (I have to cut them in half now). I’d choose the Instant Pot, i’ve been wanting one for quite some time. I love the IP so much and often could have two going at once. I would love another one! Thanks for the opportunity! Loved your Arborio rice recipe. Thanks! Congrats on 10 years! Goodness, I would choose an Instant Pot!! I want to become more adventurous with cooking, especially “basic” foods! Thanks for this blog! I am loving all these recipes, thank you soooo very much for all your hard work! Congratulations on ten years. Cheers to ten more!! Not only are the recipes terrific, but for me, the photography is also important. I would love the accessories to go with my instant pot! Found you recently – love your recipes. I have yet to purchase an Instant Pot, not sure I would use it enough. I keep thinking about it and will most likely get one on the spur of the moment. I read that there are dangers if not keet scrupulously clean so I’m a bit concerned by that. I am a big crock pot fan though. Have not checked out your you tube videos but just learned about them so I will certainly check them out. Happy Ten Years! Wished I had found you sooner! I’d choose the Instant Pot accessories – I have an IP and am always looking for new things to help me cook more in it! The instant pot would be such a blessing. Thank you so very much for all you do and for this opportunity. Our favorite crockpot and instant pot recipes have come from your site. They never disappoint. I would the instant pot accessories. I used your recipe for spaghetti squash for the instant pot today and it was awesome! Since I already have an instant pot, I would like the accessories package. Love your recipes and ideas for dinner. Thanks for hanging in there for 10 years! I recently signed up for your recipes. I have several slow cookers, which is my favorite way to cook when I know that I am cooking a few days in advance. I hadn’t heard of an instant cooker, so I looked it up. It sound interesting, so I choose…. Here’s to keeping it real and keeping it delicious! Instant pot accessories can always be useful. Thank you for your site! Congrats! !And here is to another 10 years!It must have taken a lot of commitment and I applaud women like you!Just continue to do what you love and be inspiration to so many! I just joined today and love your site! Congratulations! I love all of your recipes!! Thank you for all of your hard work. I would love the accessories! Congratulations on your 10 Year Anniversary !! I just recently found your website, since I just recently purchased an Instant Pot. I love the Instant Pot and I have enjoyed many of your recipes. A co-worker of mine is now purchasing an Instant Pot and I passed along your lasagna recipe to get him started. Thank you for the time and talent you put into this site. I will be returning to it often. PS. I would be interested in the Instant Pot Accessories. I have been with you for the past year, and am loving your recipes. I use your “Instant Pot Guide for Beginners” as my “Instant Pot Cooking Bible”. It has really helped me out! I would like the Instant Pot accessories for myself, or the Instant Pot for my son & daughter-in-law. Either way would be appreciated, if I won something. Thank you for all your easy and fantastic recipes you post every week. I always look forward to seeing what you have next. Love your recipes and I would love to win the accessory pack! 10 years is quite a milestone! Congratulations! I am still struggling with using my Instant Pot that I received for Christmas. Your recipes have helped so much! I would like to add the accessories so I could do more things. Thank you! I’m a newbie when it comes to instant pots but am enjoying experimenting. I would like to try the accessories! Thank you for the opportunity to participate in this give a way. Love your recipes. I would like the Instant Pot. I’m new to the instant pot scene. Your Facebook group and blog is great. I would like to love the instant pot accessories. Congratulations and thank you for sharing your recipes with us. You are my go to for instant pot recipes. I would like to have the accessories! I would love the Instapot Accessories. Your site is great. I’m relatively new to it. Loved the family pictures and 10 years of growth and cuteness. Congratulations and here’s to another 10 years. I would love the instant pot! I would love the Instant Pot Pressure cooker. Congrats and thanks for sharing with us! I would pick the accessories. Congratulations on your ten year anniversary. When looking for great instant pot recipes, I always start with your site. Thanks so much. Would love to win the accessories. Congratulations on your 10 years! All your recipes look so good. Received my Instant Pot for Christmas. Would love the Instant Pot Accessories. I would love to win the Instant pot accessories . Congratulations on your 10 yr anniversary and here’s to the next 10 yrs!!! Love your recipes and all your tips. I’m new to the Instant Pot so would dearly LOVE to win the accessories! Hi——Love your story, Love your blog and LOVE your recipes. Congratulations on your 10 years, I hope you have many, many more. Our favorite recipe is the Chocolate Lasagna. I would love to win the Instant Pot. Thank you! Raising my hand for Instant Pot accessories. Love the past/present pictures of your kids. It is amazing how quickly 10 years can go by. Thank you for the “real” recipes that you provide. MY kids certainly appreciate your recipes! I would love the accessories package. Thank you! Looking.forward to another 10 years! Congratulations on 10 years and hope a burning the mortgage party was had! I would love a second instant pot so I could make more dishes at the same time. Congratulations on your decade of decadence! I truly appreciate this website as it has made my meal planning so much easier. All of the recipes are spot on. I would want the instant pot accessories. I just got my instant pot for Christmas. I enjoy all your recipes. I would love the instant pot accessories. Thank you for all the awesome recipes and things you share. I would want the insta pot accessories. I would love the Instant Pot! Thank you for offering this, and congratulations on 10 years! I love the recipes on your site. Your tomato basil is my fav. If I win I would love an instant pot. Congratulations on 10 years!! Congratulations on 10 years. I LOVE LOVE LOVE my pressure cooker, using it almost every day. Your recipes and tips are great! Best of luck for many more years to come! Congratulations on 10 years and your financial freedom! I just received an Instant Pot for Christmas and am new to your site. Thanks for all of your help and expertise with it. Love your recipes! Thanks for a chance to win! Congratulations for your 10th anniversary. I hope that you can make it more and showing us more delicious recipes. I’d love the Instant Pot. Congrats on 10 years! Your recipes have become some of my family’s favorites! I would love the Instant Pot. Congratulations on your 10 year anniversary for your website. My family enjoys your recipes and I enjoy making them. I would choose the iInstant Pot Accessories if I am the chosen winner! Thank you! I just love you! You have wonderful tips and tricks! So excited for your contest. I would love to have the crock pot! Congrats on 10 years! Your blog is my go-to and I cook almost exclusively in my IP now. I would love to have another IP so I can prepare more than one recipe at a time! Congratulations 🎊!!! I’m so happy for y’all. I love your recipes and videos. I would love to have the accessories for the instant pot. 10 years..that is great and omg look st how small your kids were…time does indeed fly…here’s to another 10 years.. keep up the good work and keep on cooking. I would love your favorite accessories. Congratulations on 10 years. I just got my Instant Pot for Christmas. I’ve tried several of your recipes and love them. Thank you very much! I would love to win the accessories or the instant pot. I would love an instant pot! I currently have another brand that doesn’t have quite as many options. Love your site. I would love the accessories for the instant pot. I got a 3qt instant pot at Christmas and I love it. I’d like accessories for it. I would love to win an Instant Pot! I have a trusty slow cooker (used to be my grandmother’s, it’s a lovely shade of orange circa 1950s). I recently found your website and joined the email list! Loving every recipe I’ve tried so far. i LOVE MY INSTANT POT AND WOULD LOVE A SECOND AS I USE IT ALL THE TIME AND OFTEN COULD USE A BACK UP. I would love the accessory kit!!! I’m a newby a would love to when an Instapot….congratulations on 10 years..
Congratulations on ten years! I would love to win some accessories for my Instant Pot! Looking forward to ten more years. Congratulations! Have made many of your recipes and loved them all. I would be interested in the accessories!! I can’t get enough of the IP, and I would love to have another. I also can’t get enough of your recipes!! THANKS for what you do. I would love the Instant pot. I use so many of your recipes, it would be nice to have an instant pot. Thanks for sharing all the wonderful recipes with us for free. I love my instant pot and all the great recipes I get from you! I would love to have the accessories so I can do more! Love my InstaPot – do not know ho I could have ever done without it! I would love the instant pot accessories. I just got my pot and uts been fun trying new things. Congratulations! I would want the accessories. I got a 6 qt Crock Pot Express for Christmas and have used it so much that my husband went out and bought me the 8 qt one too! Love your recipes and have mafe several so far and they’ve all turned out great! Congrats on 10 years! My crock pot is on it’s last legs, so would choose the slow cooker. Thanks for all of your ideas and hard work! Congratulations on 10 years! I am so happy to have found your site. I have found so many recipes that I want to try. I would love a slow cooker or instant pot. Thank you for the opportunity to enter this giveaway! I would LOVE an Instant Pot! I am currently saving for one and cannot wait to get it so I can start cooking with it!!! I would choose the accessories! I just found your blog from Instagram Onceamonthmeals! I look forward to trying your recipes 🙂 In the spirit of the giveaway, if it’s not too late, I would be interested in the InstaPot Accessories! Not sure how I stumbled onto your blog, but I’m really enjoying it. I’m vegetarian, and appreciate that you offer some vegetarian recipes as well as meat ones. Even the meat ones can sometimes be adapted. 😉 You have a good sense of food combinations, and I appreciate your expertise. Thank you for what you do. Congratulations on 10 wonderful years! Thanks for the wonderful recipes. INSTANT POT. Thanks for taking the time out of your busy day to help so very many of us. Keep up the good work. Thanks again!!! Congratulations on your 10 year anniversary! I would love the accessories! I have had so much fun with my instant pot since I got it just over a month ago!! I have tried many new recipes from your website! If I win, I would love to try the stackable pans!! The instant pot would be awesome! I’ve been more adventurous with cooking since I found your site.. As I already have a 4 & 6 quart slow-cooker and a ^ quart IP I am more interested in the accessories. Here’s to your continued success. I would want the accessories. Love your recipes. Love your recipes! Not long ago I found 365. Your recipes have helped me become more comfortable using my Instant Pot. Thank you and congrats on 10 years. I would love the accessories. Please keep those recipes coming! Love my instant pot but I need more accessories to use …So it’s accessories for me. Congratulations on your 10 year anniversary! I love your site. I can’t wait for your emails to come to my inbox. I am a newbie and love all your recipes. I would love the instant pot accessories. Thanks and keep the recipes coming. I’d love to try an instant pot! Congrats! I would be interested in the accessories ! I would love the accessories to use in my very busy instant pot! Congratulations on 10 years. I love getting your recipes in my inbox. We have enjoyed several of your meals. I would love to win an instant pot. Accessories Please! I have an instant pot, and a special shelf built in my kitchen so its off the counter but still out and ready to use. I also have a stack of recipes for using it thanks to you. Accessories! Congratulations on 10 years! Wow! Congratulations on your 10 year anniversary. I’m new to Instant Pot cooking but from what I have cooked, I love it. I always used a Slow Cooker before. I think having all of the accessories would benefit me. The recipes I’ve used are from your website and every one has been delicious and your directions are so easy to follow. Thank you for the work you do perfecting the recipes and allowing all of us to do more gratifying cooking. Thanks for this opportunity. I have been a slow cooker fan for years but I am new to the Instapot. i am so fascinated by it and have been doing a lot of research. That is how I found you on You Tube, and I’m so happy I did. If I were lucky enough to win my choice would be the Instapot. I can’t wait to own one. Thanks again. Congrats on the 10 years and getting debt free! That truly is a blessing. I would love a set of those accessories! Congrats! And, thank you for all the wonderful recipes! I would love to move into the new generation by having and using an instant pot like my granddaughters. Reading your recipes make me hungry to try all of them (almost all!!). Thanks for your generous offer to some lucky winners! I bought an Instant Pot for my wife and myself for Christmas. She has only used it once, I have used it almost everyday, I love this thing. If I win I’d like another Instant Pot so I could give it to my daughter. Okay, Tonight is the Tuscan White Bean Soup but now I have to figure out what to make tomorrow night with this risotto that you posted today. I have the aborio rice and this looks so easy and so yummy. We love our instapot and your recipes. I would love the accessories. Love your blog. I would love the accessories. I am still learning how to use my IP. Love your recipes! Did your potato soup last night. It was a big hit with the family. I would love to win the Instant Pot. I have so enjoyed reading your blog posts since I found it. I would love to try am instant pot. Love your blog. I would love the instant pot accessories. My daughter gave me an instant pot for Christmas and I’m enjoying using it. Your blog is helping me. I would love to win the Instant Pot accessories. Congrats on 10 years! Hi Karen, I’ve enjoyed your posts. I would like the accessories if I win. I have a slow cooker and instant pot and love them. I’d love to try an Instant Pot! I use my slow cooker all the time but have really wanted an Instant Pot for some time now. I just got my 6qt Instant Pot and would love to get all the accessories for it! I received a Instant Pot for Christmas from my family and am in love! I found your blog and it is the best resource for tips and recipes. Thank you for your creativity and work to bring us all the delicious ways to use our appliances. Congratulations on being able to do what you love and give it us all. Were I lucky, I would like the sling. Thank you. This is such an awesome jester on your part. Being a newbie to instant pot cooking Imsearched and searched for recipes. When I found your recipes I felt I had found everything I needed to be a successful IP user. Thank you for all your hard work and dedication to all of us. Love your recipes! I’d take the Instant Pot, for sure (like reading recipes, but haven’t actually gotten one). Congratulations and May you celebrate many more years! Congratulations on 10 years! That’s quite a feat! I would love the accessories so I could be more flexible with the things I can do. Love your blog! I love my crockpot! But I am not always a good planner. The pressure cooker is my best friend. I used mine everyday. But then it died. Sad….then I saw your anniversary give away! I want to feed my family again…….well maybe. Congratulations! I love your website. My choice would be the Instant Pot accessories – most of them are already on my Amazon wish list! IP accessories! I’ve learned a ton from your recipes,videos etc. Thanks. New to Instapot use. Would love accessories. I have been getting your recipes for instant pot for a while now. I currently have an instant pot that I was given by my daughter who never used it. It is a Wolfgang Puck pot that is with a non-stick liner and not enough settings to be really versatile. I would dearly love to replace it. Thank you so much for your recipes, the adaptations for crock pot AND instant pot, as well as the very helpful videos. Appreciate all your hard work. Don’t have a food website, but do have a jewelry website. I make hand crafted and custom beaded and wire-sculpted jewelry, baby bracelets with names, family tree pins, mother’s pendants, tons of “stuff”. Karen.. You make things look so Easy .. and Fun .. I’m a single guy who works long hours and I read your emails, but haven’t jumped into the water yet .. I have an Brand New Instant Pot sitting inside my Kitchen cabinet.. I look at it and it looks at me .. Probably it;s wondering,,?? Well ..?? What’s the Hold Up Guy ..??? So.. I think I would choose the Slow Cooker.. and Hopefully start cooking and stop the Frozen Meals 3x/Day.. Thanks for the inspiration also..
Congrats on your 10 yr blog anniversary! I choose the slow cooker! Congrats on the anniversary- that’s so cool what this blog has meant for you and your family! I just got an instant pot for my birthday, was looking on YouTube for some recipes, and came across your channel. I’m really enjoying it and I’m loving learning how to use my instant pot! I’d enjoy the accessories 🙂 what a fun giveaway! Congrats on 10 years! I’ve recommended you to so many people who are new to Instant Pot cooking. I’d LOVE the accessories – was just getting ready to order some when I saw your giveaway. Keep up your good work! And thanks for all the wonderful recipes. I would love the accessories. I got an 8 qt Instant Pot for Christmas that I use almost daily, and I would love these to go with. Thank you and congrats on 10 years! Hi Karen….thanks so much for all that you do! I love your recipes!! Congratulations on 10 years! May you have another 10 glorious years posting your recipes…are there seriously that many? LOL! I’d love to have another instant pot…Thank you! Congrats on your 10 year anniversary! Enjoy your channel. Woukd live to try the stacking pots. Thanks! Hi there! I’m new to your website and instant Pot due to getting this newly crazed appliance for Christmas from my family. I’ve been going thru hard times after a death in our family and I’ve had zero desire to cook. But I need to get myself back in order and get my family back on track to eating home cooked meals again. I would love to win these accessories to help me have the tools to make anything I want and help my family and I get back to a better place in our lives. Thanks for your time! Happy anniversary. I love my IP and sometimes a 2nd instant pot would come in handy so I’d pick that. how about versions for single people. the instant pot / slow cooker can hold a lot and leftovers i’m not mocking but what about two meal for one person version? I love trying new recipes in my instantpot, I really need a set of accessories! Congrats and thank you. I’d love to win the instant pot. Thank you for your site. I look forward to all your posts. I would love the accessories. Congratulations and thanks for the great recipes and tips. I would love to win the Instant Pot. I would love an instant pot. But anything at all would be great. I get so excited when I see your latest email in my inbox. You are the reason I started to use an Instant Pot. You took all the fear out of using it by sharing your tips and yummy recipes! I would like to win the Instant Pot Duo! Thank you! Can’t get enough of my IP, my first 3 dishes were delicious! And I have tons of great recipes I want to try!! Congratulations on 10 years! 🎉🎊 I would choose the instant pot. I have one that I’ve used extensively but I use it almost every meal and need an additional pot for things like rice or chicken to add to the main “concoction.” ☺️ I love mine so much and thanks to vloggers like you, I find something new almost every day! I have a long list of things I want to try. I have only been using an Instant Pot for about 8 weeks. The majority of the recipes I have used were from the site or the Facebook group. Everything is absolutely delicious and the recipes are easy to follow & understand. Happy 10 year anniversary! I’m looking forward to the next 10 years with you. So happy to have found your site! Here’s to 10+ more years of wonderful recipes! Your site has become my go-to for instant pot recipes that really turn out just as promised! And my family always finds them delicious. I’d love a new slow cooker! I am new to your site and new to instant pot, loving the experience so far. I would choose another instant pot if I won, one is not enough. I’ve only had an instant pot for a few weeks but I am already in love. I would want the accessories to try out even more things! for many many years, and now that I’m retired, I’m enjoying a new faster, delicious way to cook, everything including chocolate desserts! I’d love to have your instant pot accessories…keeping my fingers crossed. I would love to have an instapot ! I’d like to win the accessories please. I really like your Instant Pot recipes and videos – Your yogurt video made it look so easy, I tried it even though I’m not much of a cook. It worked wonderfully the first time – I’ll never buy yogurt again. Congratulations on 10 years! Love your recipes! I’d also love to win the accessories! I love the Instant Pot and would love to win the accessories. I would love to win but don’t expect to!! Congrats!!! I wouldn’t mind winning an Instantpot. I would love to learn to cook with the instant pot! I would love to win the Instant Pot Please. Congrats on 10 years I would love any of the accessories love your recipes ! Congrats on doing your thing for 10 years, I wouldn’t mind winning an Instapot. Congrats on 10 years! I would love the accessories package as I hope that would help me use my IP more. would love to win the accessories for the Instant Pot to assist in making all the lovely recipes on this site. Love your emails and cooking ideas! I love my instapot and would love some accessories! Happy cooking! Thank you for the delicious recipes. I would love any one of the accessories. I don’t have any for my instant pot. I am enjoying your recipes. When I win 🙂 I would like the accessories. Sorry….. and the accessories please if I win. Your website has helped us prepare for our weekly meals! Thank you for all the wonderful ideas! I’m a new Instant Pot owner & would love the accessories! I started with a 6 qt. but I now have the 8qt. as I wanted a larger pot… I love love it, I have tried many of your recipes and they are delicious. Thank you, you have helped me learn to use this pot. I gave all my grandchildren these for Christmas.. Thank you again… I am anxious to try some of your new ones..
Love your recipes. I could use a 3 to 4 quart oval slow cooker! Thanks for this contest. Congratulations on your 10 year Anniversary. I love your blog, would love the instant pot accessories. I love my slow cooker the crock pot part broke so winning a new slow cooker would be divine! I would choose the instant pot. It would be awesome to have another one. 1 doesn’t seem to be enough. Congratulations on the ten years, I love the recipes you send out and have made many of them for my family. I look forward to my new recipe daily. I would love to have some accessories to go with my instant pot. I’d love to win an Instant Pot to share with my daughter. Hopefully, we’re moving out and they’ll be on their own. This is one of the best gifts my husband ever gave me! Thank you for your videos showing how to make using the instant pot easier. Congrats on your 10 years. I have enjoyed many of your recipes. I would love the accessories. Thanks! I can’t leave my own message so I am replying to your comment. I tried entering the give away, but it wouldn’t let me. I would love the Instant Pot accessories! So glad I found you and your recipes, I would love the accessories please. Enjoy watching the YouTube videos each week, would like to win the Stackable Pans for the 6 Quart. Congratulations on 10 years and thank you for the delicious recipes that have encouraged me to use my instant pot more often and even the crock pot! I would love the accessory package! Looking forward to 10 more years of recipes! Congrats on your 10 year anniversary. Thank You for all the wonderful recipes and Instant pot tips. My preference would be the instant pot. I am 75 years l and I watch every video posted about the instant pot. I would really love to have one. I am sure I would enjoy it. As I watch videos, I save the recipes, just in case I get one someday! Happy 10th Anniversary! Those little nuggets of your are all grown up! Love all your recipes and info. Would really like to win the Instant Pot! Keep all the great recipes coming! SO much has changed in ten years! Congrats and best wishes on many more years! Congrats! I’d choose the the accessories! Thank you! Congrats on 10 years!!! I love getting new recipes in my inbox! Congratulations on your tenth anniversary. Congratulations. I am trying to figure out how long I have been popping in electronically? At least half the time but not quite from the beginning. I think I caught the end of your year long slow cooker experiment. I do believe I would select the IP accessories. I have the 3qt and love it. Tries lots of recipes and been very happy. I do wish I had a 6qt so I could get more accessories and make cakes and yougart. InstantPot accessories. Thanks for the great recipes. I’m new to your site but will be checking back regularly! Will try your risotto recipe tonight. 🙂 Now that I am used to my Instant Pot, I think I am ready for some accessories! Congratulations to you ! I admit I haven’t done a lot YET….but have tried several things which I have found to be very successful. Thanks ! I would love Instant pot accessories as I don’t have any yet. Love the recipes and would love the accessories. I’m using my instant pot for the first time tonight. I love your recipes and tips. Keep up the good work. Would love the accessories. Yours was one of the first websites i found when i got my instant pot. Love it. Thank you so much for your website. I have made some of your recipes and they have been very tasty. Congratulations on your 10th! May you continue for years to come. I love my instant pot. I have annoyed many of your recipes and hints. Thanks! Congrats… Love your recipes…. Should could use an instapot…. Thanks. Congratulations! I love this blog and all your recipes! 🙂 I’d love the instant pot accessories. Thank you for all the information concerning the Instant Pot and recipes. I look forward to using it. Just love your recipes – I have shared your site with many friends and family members. I have not tried a recipe yet that I did not LOVE. Thank you for sharing and helping me love my Instant Pot even more! By the way I would love any of the prizes – but the Instant Pot Accessories would be great. Congrats on 10 years as well! Awesome! Ten years and still going strong, here’s to another 10 more!! I love your recipes and would love to win the Instant Pot Accessories. Thanks! As a newbie to this group, I am excitedly overwhelmed with the wealth of recipes of all kinds for all diets. I love trying out new ones. Thanks to you I am now learning how to use my instant pot and slow cooker with easy and delicious recipes. Congratulations on 10 years! Congratulations on 10 years! If chosen to win this awesome prize I would love to receive the accessories. I am new to the instant pot cooking method and they would come in handy. Good luck everyone! Congratulations! Thank you so much for all of the recipes you share! I would love the accessory set! Wonderful blog, wonderful recipes!! would love to have the instant pot accessories!!! Both are very nice gifts but if I had to choose one I think that I would choose the slow cooker. I have an instapot and greatly appreciate the recipes you have posted but I still like my slow cooker. What a wonderful milestone! Congratulations. I am new to your blog and love having new recipes for the instant pot. Sometimes it is hard to find a reliable source for new recipes. You at least try everything out before you post them. I would like to have the instant pot accessories. I didn’t even know that accessories were available until I read your blog! Congratulations on 10 amazing years!! Who would of thought a kitchen counter top appliance could bring such success or raise such hoopla!!!! My husband is the one who uses our IP and he just let me know he would like like some accessories for it, so if I win this it will be wonderful! Perfect timing! I love your recipes! Thanks for the giveaway! Congrats on your 10 th. Thanks for all the recipes 😊. Love the slow cooker. 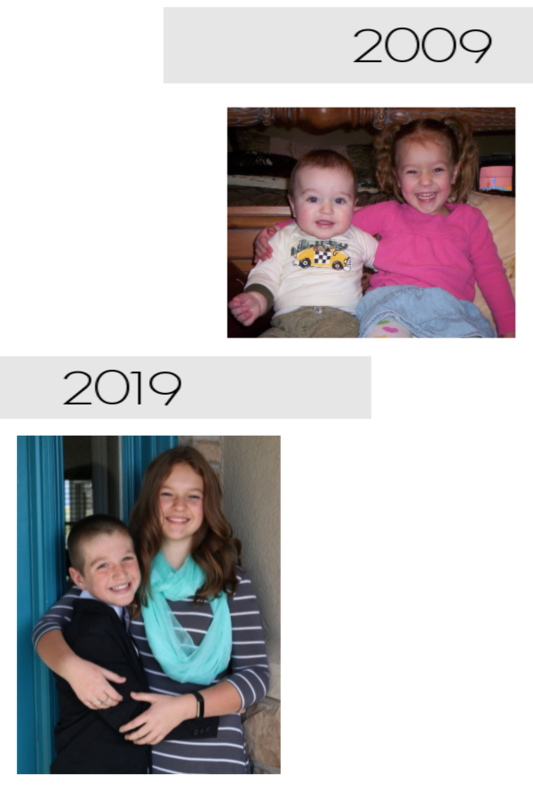 Love the two pictures of your kids from 2009 to 2019. The time goes by quickly. Love all you’ve done for those still cooking. Happy 10th. I’d love the accessories if I win. Congrats on your 10 years! Here’s to many more! I like to try the Instant pot. Love your site and recipes. I would like the slow cooker. Happy 10th with hopes for another 10 – at the very least! Congratulations on your 10 years of success. Thank you for doing the blog, I have enjoyed your recipes and have made alot of them. I would like to have the accessories, thank you for this opportunity. I’m new to instant pot and love it thanks to you and your recipes. Congrats and thank you. Glad you will be continuing. Any instant pot accessody would be great. My slow cookers are OLD, and I love that the inserts in the one you chose can go in the microwave/oven. I love your recipes and having both IP and slow cooker options! Thanks for continuing to give to others. I would love the instant pot accessories. I’ve used the slow cooker for years. I really like making freezer crockpot meals. I really haven’t been interested in an instapot (I got rid of my pressure cooker about 2 years ago when we remodeled the kitchen) but my daughter got one and really likes it. So… instapot it is for me! To the next gen years! I would love the iP! I am trying to think of something clever to say in order to win, but I am just an old fart in my rookie IP season. Yay! I found you recently and love your recipes. I’d choose the instant pot. i love that your recipes are for both the Instant Pot and for slow cookers. I would love to have the accessories if I were to win. Your ideas and recipes have been an inspiration! I am new to InstantPot and enjoy your emails. If I was to win, I would choose an IP, to give to my mum, so she could discover this whole new world! I am new to IP and have really enjoyed your blog, tips and recipes. I sure would love to win another ip. Yay!! Congratulations on the big 10! My first ever recipe in the instant pot, which ultimately led me to start really cooking and learning, was your creamy chicken and rice. Which is a staple in our household. Thank you for all you do! Congratulations! I am so glad that I found your website and love your recipes. If I win I would like the accessory set. It would go great with my new 6 quart Instant Pot. I would so love to have a 2nd Instant Pot. I’m 71 and have a small 21ft RV/Roadtrek. I live on the 4th floor of an apartment complex and when have to load up for a trip am exhausted with all of the up and down to get ready for a trip. It was interesting reading your story of stepping out of your comfort zone to do your website, way to go gal. I stepped out of mine to travel after my husband was killed in the Line Of Duty, haven’t regretted it one bit. Heres to expanding our horizons. Insta pot accessories! and thanks for all the great recipes! Congratulations on 10 years of helping us ALL out in the kitchen with these great products we are still learning our way around! I would choose the accessories. I am definitely challenged by my Instant Pot. I would love the instant pot accessories. I already have an Instant Pot and want to try more of your recipes. Thank you! I would like Instant Pot #2..thanks for the chance. Thank you for your amazing blog!!!!! I have tried SO many of your recipes and loved them all! When anyone asks me about using an instant pot i immediately recommend your blog. I would chose the instant pot accessories since i don’t have any of them yet and it would be fun to play with them! Congratulations and thank you for all the wonderful recipes. I would love the accessories for my instant pot. Thank you for all of the great recipe ideas to get me started using the Instapot. I would choose the accessories to expand the use of my instapot and to help me be more creative. Loving this website so much!! 10 yrs – Congratulations!! I would love to win an Instant Pot please. Since I have an IP and an IP mini with the accessories I need, I would love a new crock pot! Congratulations on your anniversary! I would love the instant pot accessories. I already have an Instant Pot, but no toys for it. Thank you! Happy 10th and thanks for sharing all that you do! I would choose an InstaPot please! I would go with an intantpot! We have 2 teeneage boys and you have so many great recipes it would be great to do two things at one time! I really enjoy all that you have provided to us. I have had a pressure cooker for a couple of years but have been using it more and more since I found your site. I normally don’t post much but I do use lots of your recipes an when I am looking for a certain one your site is my first spot to search. Would love the accessories. I’d love the accessory pack. I got an Instant Pot at Christmas and I love your recipes. Thank you so much for helping this newbie!!! Instant pot all the way!! I would love the Instant Pot because mine just died a few days ago and I’m so sad I can’t use it anymore! And with the Suhutdown, it may be a while before we can get another one. I just started to use the frozen chicken recipes and love them! Fingers crossed! I’d love the slow cooker or the accessories. It’s hard to pick! Instant pot accessories! Love my instant pot and would love to try something new. I recently found your site and I love it! I like to be able to use recipes for the crock pot and instant pot. Instant Pot Please! Congratulations on 10 years! Congrats on 10yrs! Ive been really wanting to try an instapot out. Id like the instant pot. I got my girls one, now i would like one for me. I’ve been wanting an Instant Pot! I love my crock pot and have heard so many great things about the Instant Pot! Congratulations on 10 years! You are amazing! I have been following you for almost the full 10 years and absolutely love your recipes! Thank you so much for the time and effort you put into your blog and books, I love them all! I would love to have a set of the accessories please. I have everything except the Insta pot – I here good things! I’d love to have one! Congratulations on 10 years! You have become my go-to for Instant Pot recipes. If Canadians are eligible, I would love the accessories! Thanks for what you’re doing. I like the instant pot please. Got an Instant Pot last summer, not sure if I’d be using it enough to have rationalized spending money on it. I think I had my answer within a week. I use it a LOT and continue to be so impressed with all its’ traits. And with the purchase of my IP, I discovered your website, which I’ve used a lot. I’d love to try out all those accessories. I would love the accessories. I love your recipes!! I use them 3-4 a week. Thank you for this giveaway and the great recipes. I love all the tips and recipes that you share. Has definitely made it much easier to use my new Instantpot. I would love to win the accessories. Thank you. Congratulations on 10 years of success! I would like to win the instant pot. I would like an instapot. I would love The accessories for the IP as I dont have a stacker yet!!! Thanks! I sure would love to have the accessories! I find so many recipes that include some of them and I don’t have any yet. Love your recipes! I would choose the instapot. What a great giveaway! I’d love to win the accessories! Love your website and recipes…many of which I need to save a try out. I’ve got an Instant Pot and would love to have those cool accessories! I want the instapot accessories. I’m hoping one day soon I’ll quit being a scardy cat and use my insta pot after having it a year. I would be lost without your recipe ideas! I would love the instant pot accessories. Wow Wow Wow, Look at all these comments. Nice to know you’ve made such a difference in so many peoples lives. And paying off your mortgage. If that’s not a sign of a successful life I don’t know what would be. Congrats on 10 years. Thanks for sharing your life with us. Here is to another 10 more. You’re site has been most helpful in learning how to use the Instant Pot. I would chose the accessories. Keep up the good work and thanks for your diligence!! I would choose the Instant Pot Accessories. Thank you! Choices, choices… I love your recipes and always save both the slow cooker and instant pot versions. The one I make on any given day depends on what’s going on in life. Either way, they just plain work. Oh well, it doesn’t matter that I can’t decide, there’s no way I’ll win. I’m 53 and have 7 + two on the way, grandkids. Two years ago I had an epiphany, if I wanted to keep up with them and their vivid imagination I had to get healthy. Since then I’ve lost 40 lbs, mostly with Keto and made several other changes to our lifestyle. some of which are cooking with my instant pot and air fryer. All of my recipes have come from pintrest and when I recently found your YouTube video about things I didn’t know, I was hooked on you. Thanks for sticking in there! I’m working on helping my sister, who has lost 100 lbs last year, and is SO a picky eater, manage her time and meals…giving her your site! I would love anything you give me. Congrats on your 10 year anniversary! I’d choose the instant pot accessory pack as I just received an instant pot for Christmas. Congratulations on a wonderful 10 years! It is a hard choice but I would love an Instant Pot. Thanks for your dedication and yours are always my go-to Recipes. Congratulations on 10 years! What an amazing accomplishment!! Thank you for the opportunity to win! I just got my first Instant Pot and would love to have an accessory kit for it! Congratulations. I would love to try the instant pot! I would choose the instant pot accessories. I am new the the instant pot and find recipes that use these but am not able try them yet. the steamer and stacking pots would be an wonderful addition to my instant pot adventure! Wow! I love your 10 Year Challenge photos! lol! I only found your blob a few weeks ago but I have already reaped the benefits! Thank you and looking forward to your next 10! I’d choose the accessory pack as I’ve been trying to build my accessory collection to make my InstantPot more useful than it already is. Congratulations! What a wonderful accomplishment ! I would choose the Intsant Pot. Congratulations on 10 yrs…time sorta flies by🤪….I would love the instant pot!!!!!!! Those babies have grown! Congrats! Congratulations! I’d choose the crockpot since mine died. I’d like whatever you want to give! I get up every morning looking for your email in my inbox…thank you for starting my day off on the right foot! Was so scared initially to use my pot, thought it might blow up. Your blog and recipes have made me more comfortable and feed my family easily and quickly. I would love to get the stackable pans.. I love your recipes! Every one I have tried has been Instant Pot success and has boosted my confidence as an Instant Pot user. Happy Anniversary! I look forward to many more delicious recipes, your IP tips and possibly a future cookbook. If I were to be your contest winner, I would just have to pick another Instant Pot! Actually, all your other items are wonderful, too and would be put to good use. Thank you for all your efforts that allow us to put something delicious and fast on the dinner table. Bought one small Insta Pot and shortly after bought a second larger one. I would be lost without your recipes to follow. They’re easy & delicious! Thanks also for teaching how to use & what type accessories to use. I would like to win the accessories for a 6 Qt pot. Thanks & God bless! Just got an Instant Pot and am excited to learn more about using it! Happy 10 Year Anniversary! That is awesome! I was first drawn to your site for your wonderful crockpot recipes and now your IP recipes. I love that you give both recipe options. I use my IP regularly but I really love using my crockpot – just dump and go. My crockpot has about had it, so I’d love a new one! Congratulations, again on your accomplishments! I live in upstate NY, where last week, it was -14°, with a wind chill of -30!!! My crockpots are my best friends from November through May!! There is always something cooking in at least one at my house, and I would love to win another one! I have gotten some of the best recipes from your site! There’s always something I can find, no matter what I’m in the mood for! Please keep posting your deliciousness!! Congratulations on your 10 years! Love your recipes. I have an instant pot but no of the accessories except what came with the pot. Oops! I forgot to say what I would choose. I would love to have a second instant pot. Or the accessory set would be awesome too. I LOVE your website. I just started cooking with my instant pot less than a year ago. You are a lifesaver! I’ve found so many yummy recipes and I was thrilled to learn my 23 year old son (who lives 4 hours away) finally decided it was time to learn to cook. (He’s an avid cyclist and has decided he wants to move his game to the next level. Funny, he’ll listen to an author writing a cycling training book who says nutrition is just as important as the physical training, but he wouldn’t listen to his mother telling him he cannot continue eating just chicken nuggets, frozen pizzas, salami sandwiches and chips!). Anyway, a week after Black Friday he told me he needs to learn how to cook and that an instant pot would be nice for Christmas. I jumped at the chance. He got the instant pot, accessories and I registered him on your site to receive emails. He has been having fun cooking now too! Thank you thank you thank you for making this so easy for us! Maybe when he comes home again HE can make dinner. Win win! Happy 10th Anniversary! Your blog is the reason I have decided to embrace the Instant Pot that I haven’t used since I purchased it in 2017! Now, I’m in love with it and your recipes, hints and encouragements! Congrats on 10 years! I would love a chance at the Insta Pot Accessories! Congratulations on your 10 years! Quite an accomplishment! I really enjoy getting your emails, thank you!! Being free from having bills hanging over your head is a wonderful feeling! We have been blessed with this feeling for a few years now. Enjoy your new found freedom. I would choose the instant pot. I’m the only one in the family that doesn’t own one. Even my 79 year old mother has one!!!! I am inspired by your recipies. At the moment I only have a crock pot. I love that you have recipies for both. Congrats on 10 years!! Your site is my go-to for most nights dinners! With my husband and I working long hour, full-time jobs and a 3 year old, I need fast and delicious meals that do not take up all my free time! If I won I would pick the Instant Pot accessories. Yo are wonderful, keep shining bright! Just subscribed to your recipes recently. Have really enjoyed the ones we’ve tried. Congratulations on 10 years. Instant pot accessories for 8 qt would be awesome. I would LOOOOOOOOOOOVE the Instant Pot accessories!! Love your daily recipes! Thanks for all you do! Love the recipes to try with either my Instant Pot or slow cooker. I gave your 5- Ingredient Slow Cooker book to my brother, who was attempting to learn how to cook with his slow cooker. If I was picked, anything would be appreciated. I would choose the accessories. Keep the recipes coming. We love trying new things. I really enjoy all your recipes, and since reading your blogs have bought the instant pot. I am an older widow and have a disabled son living with me. The instant pot is such a blessing along with your recipes. Congradulations and I would love to win the Accessories. I would love to surprise my wife with the accessories for the 6 qrt pot. We use our instant pot about 3 times a week. FYI, thanks for the recipes I have tried many of them and got rave reviews. I would love an instant pot as a gift for my son, who is a great cook, but doesn’t have one. I love your recipes! Congratulations! Thank you for helping make dinner time a lot smoother. I would choose the accessories. I’m obsessed with my new instant pot and would love the accessories! Your chicken garlic Parmesan is a favorite in our house!! I would love to have the accessories, hope to learn to use my instant pot more! I love my instant pot. I would love the accessories. 10 years!! What an Amazing Achievement!! I’d love the Accessories, if I were to win! Happy anniversary! I found your website right after I bought my daughters-in-love Instant Pots for Christmas last year. I’ve made many of your recipes and haven’t found one I don’t like yet. I’d choose the IP accessories. Thanks! would really like an instant pot! Congrats on 10 years of blogging and thanks for all the great recipes. Such an accomplishment! I’d choose the Instantpot. Congratulations on 10 years. I got my instant pot for Christmas and so far have made a couple of meals in it love it and would like to win the accessories please. Thanks for all the great recipes! Congratulations on 10 years! I would love to have an Instant Pot! Would love instant pot assesories, use your recipes all the time. I have been cooking for over 50 year’s it’s time to upgrade to a insta pot!!!!!!!!!!!! Love your blog, ever since it was only crock pot recipes! I’d like to win a new INSTANT POT, please! I would love to win the instant pot accessories! Love your IP recipes! They have really helped me to utilize my IP more with dishes my family loves. Thanks for your help and happy anniversary! Hi and congratulations! I would choose the instant pot to give to my nurse daughter. I’d fill it with your wonderful recipes as a surprise for her! After two years I finally gained the confidence to give my instant pot a try and I’m sold! Your recipes give me the confidence and such great recipes that I feel like a new bride all over trying new recipes on my groom, only it’s 38 years later! I’m wanting the accessories for my instant pot if chosen. After accumulating 5 Crock Pots over the years and winning an Instant Pot at Christmas, I would love the accessories package. Congratulations. Oh my , love my instant pot! I wondered where I would store it when not in use but it was used nearly every day so that was never an issue. I would love the accessories so I can try even more recipes. Congratulations on 10 years! The accessories would be great! :Love the IP recipes. Especially the low carb ones or can be converted to low carb. Since my neighbor bought me an IP I have been sharing my recipes from your site with the neighbors. They just love it so much and so it would be much easier for me to have the accessories. As a senior citizen I really connect with my younger neighbors and it is mostly because of your delicious recipes. We all love them very tasty. As a newbie to the Instant pot your blog has been so helpful for ideas as well as amazing tips and tricks. Congrats on 10 years and looking forward to 10 more! I would love the Instant pot accessories to continue my IP cooking adventures! Accessories please. Love your recipes. Congratulations on 10 years !!!!!! I would love the accessories pack. I’m new to the IP and have gotten all my recipes from your site !!!! My hubby is one happy camper !!! I discovered you on Yummly and have been making your great recipes for about 2 years now. I would love a new slow cooker (my 6 quart is from 1995 when I got married)! Congratulations on 10 years! Congratulations! I also started blogging 2009 (I’m a book blogger). Time flies! Your children are beautiful. Thank you for all your wonderful recipes. I tell everyone you’re my go-to site for pressure cooker recipes. I would choose the Instant Pot. Thanks for the chance! love your site.use your slow cooker recipes. would love an instant pot.only found you a few months ago.lovely to khow you have been going so long.Congrats on being debt free. Congratulations on ten years! Thanks so much for sharing your delicious recipes. I would love to win the slow cooker! Would love to win an InstaPot. Happy 10th Anniversary and Congratulations on your success. I’m so glad that I found your site because it is definitely my go to place for help in the kitchen. I was scared of my instant pot until I read some of your tips and hints. I now Love it and rely on you for great recipes that my family will eat. I would love to win the accessories package. Thank you for all the delicious IP recipes you provide free for all of us! Congratulations, Karen, on 10 successful years of hard work! My choice would be for the Instant Pot Accessories. Thank you. I would LOVE the Instant Pot! Thank you for this amazing giveaway. I would love ithe instant pot accessories. Congratulations on 10 years!! I choose the accessories. I make yogurt every week in my Instant Pot. Since it tied it up for 9 hours I wasn’t able to use it for dinner so I was “forced” to buy a second one. Now I call them “The Twins”. I would love to win the accessory package. I use a lot of your recipes and really appreciate them. Keep up the great work. I would love to have the accessory pack for the IP. I have been following you for two years and I love most of your recipes. I’m a widower now and need help cooking for my self Thank you! I would love the Instant pot . Congratulations! I’m just learning how to use my Instant Pot. So far I made 3 meals. The first was a disaster!!!!! The next two were soup and was a success! I am very pleased with my pot. I would love to win the accessories for my instant pot! I have been following you for two years and I love most of your recipes. I’m a widower now and need help cooking for my self Thank you! An instant pot would bring many of your recipes to my home and family to be truly enjoyed. So glad I am able to enjoy making your delicious recipes! Thank you and congratulations. If I won, I would choose the instant pot. I love your site and recipes. I would choose the accessories. The instant pot would be nice. I can no longer stand long enough to cook a meal, so the instant pot would be ideal and with all your great recipes how could I go wrong. I love the step by step instructions because they are always so easy to understand. I have heard so many comments about the instant pot and I would love to try it. Thank you for all your hard work. I have been using my instant pot for about a year now and have made several of your recipes. I have also love all of the tips that you have posted for all of us that are new to the IP. I’m sure it has saved me so major headaches along the way. Congratulations on 10 years and hope you have another 10. Thank you!!. Hi from a mom of two daughters. I got my Instant Pot a year ago. After sharing pics to my daughters , they both asked for a pot for their individual birthdays. Since then I found your fabulous 365 site, and then shared it with them. I am proud to say that my one daughter who HATED to cook now is getting so adventurous with her pot using your recipes as the catalyst. I love your recipes and have shared them with family and friends who have become potheads. Congratulations on your blog and may you have continued success. I will take anything, they’re all great prizes! I would love the IP accessories! Congrats on 10 years! I would like the Accessories for my Instant Pot. Thank you for running the contest. Congrats on the 10 years! I love your recipes and tips! The IP Accessories would be a great addition to my kitchen! never knowing what to cook. Now I seriously have choices, easy delicious choices!!! Thank You! I’ve never had an Instant Pot, I would LOVE to receive one. Congratulations on your Success !!! Would love the IP accessories! Love your site Karen. Always enjoy whatever I make from your recipes. I would love to win the accessories as I already have 2 Instant Pots. Here’s to another 10 years of great recipes from you! My life is so much easier since I discovered your Instant Pot recipes. I use the Instant Pot almost every day. Thank you so much! The accessories would be super useful. Congratulations on your 10 years! Here’s to 10 more! I received an instant pot for Christmas so I would love to win the accessories prize! I’m loving my instant pot and loving your recipes! Thank you! Ahhhhh without a doubt… Lasagna chicken soup is my all-time favorite… as is runner-up Tortellini soup! Just got the Fat- Daddio and will now cheesecake! Love another Instant Pot or even Accessories! Any of the accessories would be fantastic! I am thrilled to have found your page and being a newbie, do not have any of the accessories yet. Would love to win, but if not, that’s ok as well – as long as you and everyone else here keeps the recipes and the tips coming! Thank you for your wonderful videos and your page. Hoping to make my first meal this week – wish me luck! Hello my dear! This is fun that it has been 10 years. So cool! I’m so happy for your success. I have never had an instapot, so I guess that. I am a newbie to your website and newsletter. Great recipes! Have saved so many already! I’d love an Instant Pot. I could use a crockpot. Got rid of ours when we got the Instantpot. Could use both. I just got my Instant Pot and would love the accessories. Thank you! I’m enjoying your recipes! Congratulations on 10 years. I would love to have an instant pot. Thank you so much for all of the great recipes and the help navigating the instant pot. My choice would be the accessories. I would love another instant pot! Your recipes are amazing! Keep them coming for another 10 Years!! I would choose the Instant Pot. I do have a 6qt Duo but would love to have a second IP to gift to my sister, who could really use one! I would love the accessories, thank you! I would love an Instant Pot. Love your recipes too! Congratulations! Here’s to 10 more years of awesomeness! I forgot to say that I would choose the Instant Pot accessories if I win the prize. Again, congratulations and keep up the good work! Love your recipes! I would love (and use frequently) the Instant Pot accessories.
. It’s a win win. Keeping my fingers crossed and eyes squinted waiting to hear I won it!. Used a crock pot for years and truly love my Instapot. Dont tell my Crock Pot…My favorite recipe is the creamy ranch chicken. Make this at least twice a month. I would want to win the instant pot. Congratulations on 10 years! I have loved making many of your slow cooker recipes. I would love to try your instant pot recipes. I would want to win the instant pot. Congtas on 10:years and especially being debt free. I have all of the prizes, so I would give my granddaughter the Instapot. We love your recipes. I use my IPs almost every day. I hae 2 Instant Pots and would love a 3rd. Congrats and Thank You! Almost all of my IP recipes come from you!! And my family loves them all! I could definitely use some accessories. The only thing I have purchased for my IP was an extra set of silicon rings, as my original one broke. And I trusted you and got the ones you recommended and LOVE them! Thanks again for all the great recipes. Keep them coming!! Thanks so much for all the great recipes! I found you last year and have printed and tried many! I would love an instant pot! Thanks so much for the contest too! Just got an instant pot & could really use the accessories. I would love ip accessories! Instapot!! Congrats & thanks for the giveaway!! Congratulations on 10 years of blogging. I would choose the instant pot as I don’t have one of those and would like to try it. I have 2 Instant Pots, so I would pick the accessories. Thank you!! You have awesome recipes! I love your site and I would love an instant pot. I have been resisting for too long! Ten years, wow. I discovered you a couple of years ago and use your recipes all the time, both IP and crockpot. I’d love to win another IP or the accessories. Congratulations on 10 years! I would love the IP accessories! I rarely cook in my crockpot anymore. Love seeing how things have changed! and congrats on 10 years! I have and love my instant pot but would love to have those accessories! Happy 10 year anniversary! I would LOVE the Instant Pot accessories to complement my new Instant Pot! Congratulations on Ten great years!! I appreciate all the simple and yummy recipes! I would love the Accessories!! By the way, your children are beautiful!! Wow, 10 years! Awesome! I got an Instant pot last year and would love some accessories! Congratulations. I’m an Instant Pot Newbie, and I’ve been enjoying your recipes and helpful information. If I win, I would like the accessories to use with my new 8 quart Duo. Thank you. Congrats for your 10 years. I would like to win the Instant Pot because I already have a slow cooker. I love your recipes and if I win I’d love the Instant Pot. Congratulations on your success…you deserve it! Happy anniversary! Wishing you many more year blogging! I am new using an Instant Pot and really love the recipes. I think the accessory pack would be an awesome prize and would help me a lot. Thanks for all of your hard work. My whole family enjoys your recipes. Congratulations wishing you many more years of success. I love seeing new recipes to try and breaking out of being intimated by my Instant Pot. I would go doe the Instant Pot accessories. Happy anniversary, I only cook your recipes. I don,’t look any farther. I get excited to see that I got an email from you. All of it recipes are excellent. I would be blessed to get the accessaries. Thank you for everything. Instant Pot, for sure! 🙂 Thank you for this opportunity and for your simple and delicious meals… for FREE! I would love to win the instant pot accessory set. I have had my instant pot for a few months now and would love some accessories. If it’s the 6 qt., I think the Instant Pot would be amazing! I have the small one but would love the lager one. If it’s the smaller, I’d opt for the slow cooker. Thanks for all you do for you’re followers! Congrats and thanks for all the recipes!! Here’s to another 10 years!! I would LOVE an instant pot!! Wow what a wonderful giveaway! I love my Instant Pot and have learned so much from you! Thanks so much. 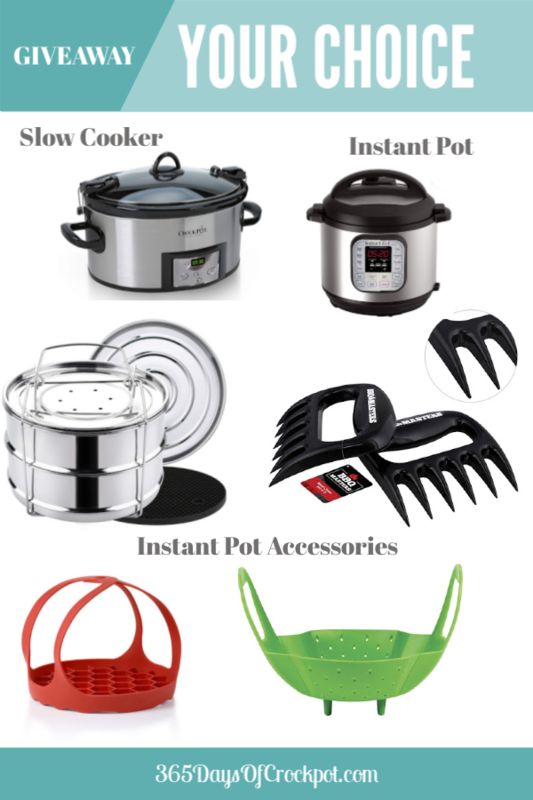 I would love to win the Instant Pot accessories. I love all 3 of your cookbooks. I can’t wait until you come out with your instant pot cookbook – I need it so I become more used to using my instant pot. The slow cooker is still my go-to because of how easy it is to use. I would love the instant pot accessories so I can learn to do pot in pot cooking to have my entire meal cooked at once. Thanks for all you do Karen. Here’s to another 10 years to come! I’m new to the Instant Pot and love your recipes. I would live to win the accessory package. Congrats on 10 years and here’s to the next 10 years. Thank you so very much for your blog and all the good recipes. I’ve tried a number of them and love everyone. I would love a second Instant Pot if I were to win, because mine is in use almost every day, and sometimes a couple of times in one day. I love your newsletter and website and have tried some of your recipes. I would love to have an instant pot to give to my son who cooks for his 3 daughters. I tried to leave a post with my choice but I couldn’t get it to post. I would choose the accessories. I love the segments when you have your children demo something! I love the cute mischievous smile your son has! Tell him for me that he will make a great chief someday . It reminds me of my boys when they were small! Congrats!! Im new to the sight a instapot would be great!!!!! I am new to the IP (and was afraid to try it from Black Friday until this weekend 1/26 when I somehow stumbled across your website!) Congratulations on 10 years and thank you for all the recipes and encouragement!!! I would like another instant pot if I were to win the giveaway. Just got an instant pot so would love the accessories! Congratulations! I would love to win a new slow cooker! I’d love the Instant Pot Accessory package! I would love accessories for the instant pot as they would expand my options. Congratulations on 10 years of recipes shared! I really enjoy your blog! I have tried several of the recipes. My family really liked them! If I win, I would like to have the Instant Pot accessories. Congratulations on 10 years. I’ve used your slow cooker recipes with great success. Don’t have an “insta pot” so that would be my choice. Best wishes for many more years. What a gift you have given us! Thanks for ALL the great recipes. I love the beef and chicken gyros recipes. My Hungarian friend tells me the recipe for Tiziki is like her mom’s recipe – she begged or the recipe! I would like to win an Instant Pot. Thank you for sharing all of your hard work to help your fans and followers serve great meals! I truly appreciate what you do. You convinced me that an Instant Pot was worth the investment – and you taught me how to use it! I would love to win the crockpot for those recipes that are just better “low and slow”. But the IP accessories would be wonderful as well. Congratulations on 10 years – and to many more! Happy 10 year anniversary; hope you have many more!!!! My 16 year wedding anniversary is on Friday the 1st!! If I were to win I would appreciate the instant pot accessories. Thank you for sharing all your wonderful recipes. If I won I would love to receive the instant pot accessories. Congrats on 10 years! Love your blog by the way and so does my family! 😉 If I was to win I would love to have the Instant Pot! I already have one, 6 quart, but 2 would be awesome! Supper and dessert both going at it at the same time, heck yeah! Thanks for this awesome giveaway! I’m brand new to your blog. I received an insta pot for Christmas and I started looking for recipes so I can fully use my new pot. I would love to get the accessories. I will love to see what you will have out there for the next ten years. Congratulations on 10 years. Yours is the best Instant Pot and slow cooker blog on the web. I’d like to have the accessories if I win. Thanks for the giveaway! I really enjoy your recipes! I have tried several of them. My family really liked them. I would love any of the three, but will choose the IP accessories. Would love any of them but would especially love the accessories bundle! Awww, your children are SO cyooot ♥ Aaaand, Congratulations on Freedom from Debt, that is huge!!! *If my name were drawn, I would choose the Instant Pot. I have an instant pot so I would love to win the Instant Pot accessories! I just joined and have already made a couple recipes. My husband loved them all! Thank you for making the IP recipes so easy to follow. Can’t wait to see more! Just got an instant pot and would LOVE the accessories! Congrats on your anniversary! Funny how time flies. I love your posts/emails and your recipes….I use them all the time! I would love to receive the IP Accessory Kit if I won. Congrats on reaching ten years! I would LOVE to have your accessories package!!! Happy Anniversary! I can always use another crock pot! I love your website. I would like to win the slow cooker. I would choose the accessories. I only subscribe to your blog as you use down to earth ingredients. Most of the time i have what I need without going to the store. Just made your Creamy Potato soup. YUMMY. Happy Anniversary! I would choose the Instant Pot Accessories. I am pretty new to your site and have tried a few of your IP recipes and they were great! Thank You! Hearty congratulations to you and your family! Here’s to another wonderful ten years. I would love the multi pot insert. I would love the accessories for my Instant Pot because I’m just starting to branch out in my IP attempts. I look forward every day to your recipes. I have tried several and they are always successful. Whenever I experience an IP failure I always come back to your tried and true recipes. Thank you for all the adventures and many more to come! CONGRATS, I LOVE YOUR RECIPES. IF I WIN I WOULD LOVE THE INSTANT POT ACCESORIES. I LOVE MY INSTANT POT!! ANXIOUS TO TRY YOUR YOGURT IN MINE. Your recipes are the best. Gave your website address to young single father just a couple of months ago. He is one of many to be referred to your cookbooks and website. You have helped the younger generation learn to cook. And the older generation who needs a refresher, or becomes a widower and wants to keep their independence. You are a blessing to many. Hope you have another wonderful 10 years. Would love the slow cooker. So excited! Congratulations on 10 years of GREAT recipes!! I am interested in the Instant Pot! I would love the IP accessories! Thank you. I love your recipes! Congrats! If I’m lucky enough to win, I’d go for the IP accessories. Cheers to another 10 years! I would l💗be the accessories to go with my IP. I’m loving making amazing recipes with my IP. Thanks for all the recipes! I just recently bought an Instant Pot, but love to have any accessories! I love you blog/website. Especially love that you give a link to “jump to the recipe”. Thanks too for the daily emailed recipes! I recommend you to anyone just starting on the Instant Pot path as an excellent resource. Keep up the good work. Definitely the instant pot! I’ve given several pots as gifts to friends & family, because they are awesome (pots & people!)! Have also recommended your blog to everyone., because your recipes are “real” – no wacky ingredients or ten thousand prep steps. Love the recipes & tips & can’t wait for keto recipes! I would be happy to have anything but if I get to choose I would like the Instant Pot because I have an older pressure cooker, Thank you for the opportunity and congratulations on all of your accomplishments! I always check your website first when I’m looking for a great dinner idea! Thank you for sharing your talents and making my life a little less stressful! The Instant Pot accessories look fun to try out in my kitchen. I’m only six months into using my IP and I am loving it! I have made at least a dozen of your IP recipes. All have been relatively easy to put together and very tasty!! I give your name and web info to anyone I speak with that has an IP 🙂 It has been a fun journey for me learn how to use my IP. i am by no means an expert, but the learning has renewed my confidence in being able to put together nice, delicious meals! So, thank you for helping me through the IP adventure! I would be interested in the Instant Pot. How pleased you must be at your success! I am grateful for all the delicious recipes you have shared with those of us beginning our instant pot adventure. Because my crockpot is from 1978, I think I would choose to have a new crockpot. Thanks for all you do for us! wow that has lasted a long time!! Hoping for another 10 years and longer for you, Karen! Now that you’re debt free, the next milestone for you will be saving for college for those beautiful kids of yours! Congrats I love your recipes! I would pick the Instant Pot because mine is getting old and because it is never a bad idea to,have a backup. Congrats! I just found you today and I’m so excited! Thank you for doing this giveaway! I would prefer the stackable pans if I win! Have liked all of the instant pot recipes I’ve tried of yours so far. Sorry, missed the zero….congrats on 10 years!!!! Thank you so much for all of your great ideas! It is such a blessing to count on tested, great recipes from you. I look forward to following you for the next 10 years (and more!). Thank you for having a fun giveaway! I would most prefer an instant pot, but it is not for myself. I know a young mom who has had to return to work full-time and is homeschooling her 3 children. I would love to bless her with an instant pot to make her life a little easier! Congratulations! Thanks for all the recipes. This is my year to get an instant pot whether I win or not. Congratulations on your 10 year anniversary. I love your page and all the recipes. If I won I would like the Instant Pot accessories. Congratulations! And thank you for the chance to win the accessories package. Many of our favorite recipes come from your site, so thanks again. Happy Blog-aversary! 🙂 Pat yourself on the back because you have accomplished so much. I am a newcomer to your blog and am delighted. IF I were to win, I think I would choose the Instant Pot accessories. I already have an instant pot. My second choice would be the crock pot. Congrats! The IP accessories, esp the stacking pots. Congrats on 10 years! You have great recipes, especially for the instant pot. If I win, I’d like the red or green silicone sling/steamer. I love your website http://www.365daysofcrockpot.com. My hope is for you to have continued success. I would like the Instant Pot accessories. Thank you. I would love to win the Instant Pot. I’d give it to my new granddaughter-in-law. She’s in med school and I know it would be a big help preparing meals for herself and my grandson! I love mine and I love your recipes!! Congratulations on your 10-year anniversary!! 10 years already?? ?I think I’ve been following for a good portion of it!!!!!!!! I’d like to win the Instant Pot itself…..I have YET to perfect a roast, and I think I might have a chance of having the PERFECT one if I win the pot!!!! I love your recipes and am looking forward to the next 10 years!!!! Thank you for all your hard work. I would love the Instant Pot accessories to go along with my new Instant Pot! 😀 I’m grateful my sister-in-law shared your website with me so that I can try out your recipes as I learn all about the Instant Pot. Wishing you CONGRATULATIONS and thanking you for all the recipes, recommendations, videos and tips you have provided for the past 10 years. I would love to win either the sling or the steamer basket. Wishing you nothing but the best going forward!